If freshness were asked to select a representative host that embodies what it truly tastes and smells like, it might choose basil. Few other garden treasures capture that ephemeral state of being alive like a just-snipped sprig of glossy, bright green basil. A gentle crush releases its unmistakable sweet-spicy musk, and a piece torn and chewed just seconds after it was harvested is an intimate kiss with Mother Nature herself. Just one hour later, that sprig will be a darkened, crumpled shadow of its former lively glory, wilted and bittered by its time off the stem. Gardeners know this, and so do chefs. That’s why a growing number of local restaurants have begun to keep gardens just outside the kitchen door, where produce is quick stroll and snip away from the plates. For most, the garden supplements deliveries from local farmers and provides herbs, vegetables and flowers that simply don’t hold up well in transport or storage. Some call it hyper-local farm-to-table, others call it common sense. Restaurant gardens come in all shapes and sizes, from a few big pots of fresh herbs all the way to a horticulturist-tended plot measuring several thousand square feet. While the National Restaurant Association ranks “hyper-local” as one of the top 10 food and beverage trends for 2019, Western New York eating establishments have been cultivating culinary crops on site for years. At Frank’s Grille in Lancaster, dessert chef Sandie Hennessey tends two raised beds that provide the Italian restaurant with a small but important portion of the herbs and vegetables it uses most. She grows chives to season potatoes, parsley that garnishes most plates, plenty of basil for eggplant specials and margarita pizza, and cherry tomatoes for salads. Over the years she’s added a few other crops that offer affordability and flexibility for the kitchen. While Frank’s keeps it easy, Black Sheep bistro chef Steven Gedra says that when his team first built their kitchen gardens on Buffalo’s West Side, they bit off more than they could chew. Nobody was a gardener, and the endeavor quickly became overwhelming for a busy crew whose focus was needed in the kitchen. They’ve since scaled back to focus on the items that are expensive, hard to get, or best picked fresh, plus a few quirky experiments each season. Behind the restaurant, a long wooden raised bed runs the length of the dining patio and bursts with horseradish, garlic and fragrant herbs with edible flowers like chives, basil, cilantro and rosemary. Last year they harvested almost 40 pounds of sunchokes; this year there might be more chili peppers, tomatoes and a couple weird things. Not only do the plants provide ingredients for Gedra’s seasonally inspired and ever-changing menu, they have practical contributions to diners’ comfort. Next to the Black Sheep building, in an empty, grassy lot, buckets of shrubs and a small grove of fruit trees produce blackberries, raspberries, mulberries apples, pears, plums and peaches. The trees full of fragile fruit, says Gedra, are sensitive to grow but worth the experience. Growing food in service of patrons has deeper roots at 100 Acres: The Kitchens at Hotel Henry on the Richardson Olmsted Complex. The restaurant’s name is an homage to the 100 acres that were originally set aside for farming in the 1880s to provide food and outdoor work for residents of the state asylum for the insane. Today, a 5,000-square-foot crucifix-shaped garden has been restored on the grounds to provide fresh produce, herbs and flowers for the restaurant and hotel special events. It’s a collaborative project led by 100 Acres horticulturist John Santomieri with input from chef Michael Thill and tending help from volunteers and servers who want to know more about what’s grown there. The ample lot brims with a carefully planned, colorful collection of plants. There’s plenty of herbs, eggplant, kale, lavender, pole beans, radishes, elderberries, heirloom tomatoes and a nearly endless supply of edible flowers. The bounty makes its way into most of the menu in the form of featured small plates like baba ganoush, fresh corn polenta, spirit infusions behind the bar and an endless application of thoughtful, edible garnishes. Tables are all set with fresh cut flowers and wild cuttings from the landscape. Even the paint in the corridor that links the restaurant with the hotel is made from a special light-refracting mix colored by sumac, amaranth, beet, blueberry and geranium from the gardens. Santomieri mixed it by hand for a project he completed as part of his MFA studies in Biological Art at the University of Buffalo. The site-specific pigment is designed to benefit the scented geraniums that were dug up from the garden, potted and placed along the wall. 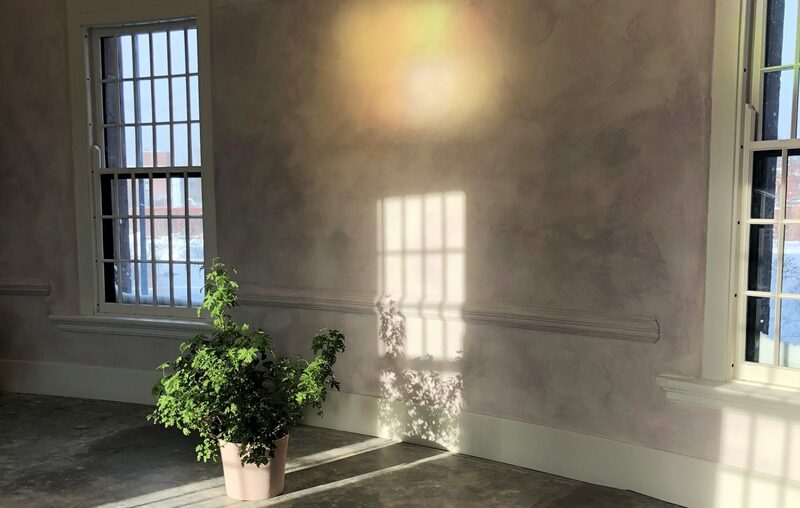 The plants respond to the sun’s spectral violet wavelengths refracted by the walls’ combination of color and mineral content. It’s a project that underscores the beneficial relationship between sunlight, plants and health that was a central tenant of the former asylum’s original groundbreaking design. For Thill, the garden also holds reverence for the site’s history with a healthy dose of sensibility and diner appreciation.